This Fountaine Pajot Mahe 36 is powered by two Volvo 38hp diesel engine with folding propellers. The hull has been treated with three coats of copper coating. She has also been fitted with an auxiliary heating system. This Mahe 36 features a roller furling genoa and a slab reefing main with sail cover. Accommodation is provided within 3 double cabins onboard this Fountaine Pajot 36. There are also two bathrooms with showers. The saloon and galley area is spacious and offers great views from the large windows. The spacious aft cockpit is directly accessible from the saloon through large sliding doors, there is plentiful seating and a removable cockpit table. The helm position is situated to starboard. 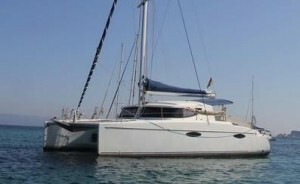 This Fountaine Pajot Mahe 36 is also equipped with a RIB tender and a 20hp Honda outboard engine.